a motorised gate entrance may be opened fully using one code, or activate the pedestrian opening using another, and switching on the house alarm using a third. The same memory module used on the D10 industrial sliding gate motor, may also be used on the SMARTGUARDair, allowing all the settings and codes to be backed up and restored in seconds. 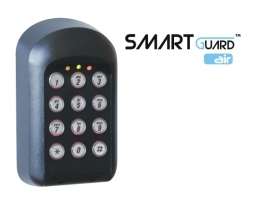 The CENTURION SMARTGUARDair keypad also boasts a ‘downcounter’ allowing selected codes to have a limited number of uses. This is ideal for granting single occasion access, for example to an armed response company, with the code automatically deleting itself after use. There are 15 separate channels, each of which can be paired with a CENTURION code-hopping receiver which means that up to 15 different devices can be activated using the SMARTGUARDair wireless keypad. Such functionality caters for many different scenarios for example, a motorised gate entrance may be opened fully using one code, activate the pedestrian opening using another, and switching on the house alarm using a third. The SMARTGUARDair is a wireless model making it easy to install. It operates off two AA Alkaline batteries (included) which provide up to two years of battery life with up to 300 operations per day! It is compatible with CENTURION’s ultra-secure code-hopping receivers, including those onboard in many of our new operator controllers.